Tucking tidily into a corner of your bedroom, the Portage Collection presents a unique platform for sleep or relaxation. 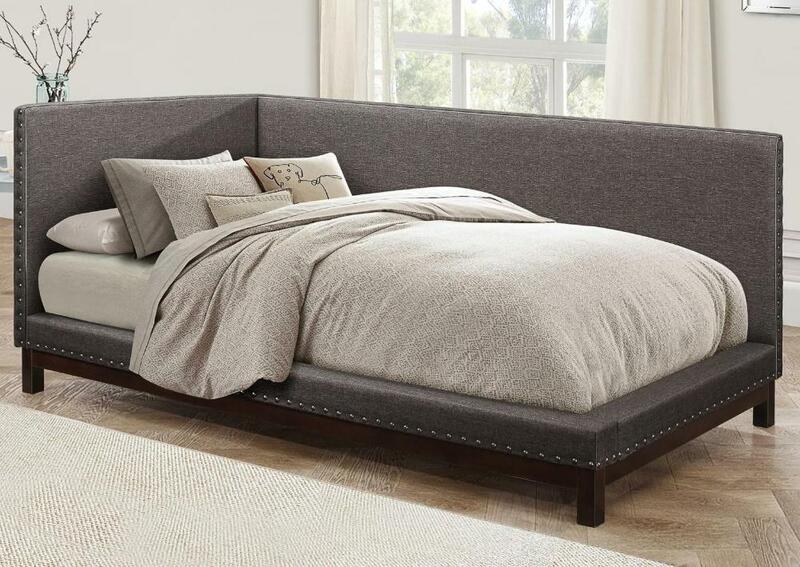 The profile of the corner panels and bed frame feature nail-head accent that complements the dark gray fabric covering. Your mattress will sit atop a low-profile platform that is supported by dark finished wood legs making for a convenient spot to sit or sleep. FEATURES: Dark Gray Finish ~ Transitional / Contemporary Style ~ Nail-Head Accents ~ L-Shaped Panel Design ~ 100% Polyester Fabric Upholstered.